Organise your bathroom Properly. Lotion/Soap Dispenser, Soap Dish, Toothbrush Holder, Tumbler, Waste Bin, and Toilet Brush. Toilet Brush & Holder: H36 x W9 x D9 cm. 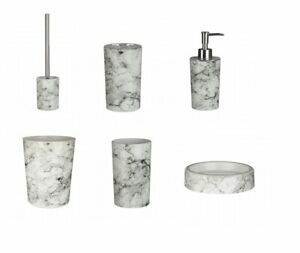 Marble Effect Bathroom Accessories Set.